SqueePlay Unveils New MSPCA In-Game Branded Items for "National Puppy Day"
BOSTON, MA--(Marketwire - Mar 22, 2013) - SqueePlay, a new company focused on the creation of next generation Facebook games, today announced for "National Puppy Day" that the company will raise funds for the Massachusetts Society for the Prevention of Cruelty to Animals (MSPCA) through its SqueeDogs Facebook video game. Be one of the first to play the game and influence its direction by signing up at http://squeeplay.com/wp/squeedogs-beta/. "Through SqueeDogs, we are excited to raise funds and bring attention to one of our favorite causes," said Elliot Pirate Epstein, CEO of SqueePlay. "As 'pet parents' of several rescue dogs (and cats), we know how great the need is. There are always animals awaiting adoption." The MSPCA-Angell is a national and international leader in animal protection and veterinary medicine and provides direct hands-on care for thousands of animals each year. Founded in 1868, it is the second-oldest humane society in the United States. Services include animal protection and adoption, advocacy, humane education, law enforcement, and world-class veterinary care. The MSPCA-Angell is a private, non-profit organization. It does not receive any government funding nor is it funded or operated by any national humane organization. The MSPCA-Angell relies solely on the support and contributions of individuals who care about animals. Please visit www.mspca.org. Founded by mother-son team Cerise Jacobs and Pirate Epstein, SqueePlay is a creator of Web-based 3D casual games. The company is named after the urban dictionary definition of squee (to squeal with glee; from a combination of the two words). SqueePlay makes the games that players around the world "squee" about. SqueePlay's first game, SqueeDogs, will launch April 2013. For more information, visit www.squeeplay.com. 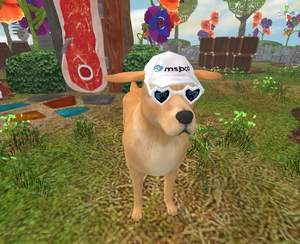 SqueeDogs' new MSPCA in-game items help raise money for the MSPCA.